Maryland’s newly designated Mallows Bay marine sanctuary is the first in the Chesapeake Bay, the United States' largest estuary. It also contains the biggest U.S. collection of historic shipwrecks, nominators said. 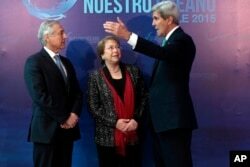 Chile's Foreign Minister Heraldo Munoz, left, and President Michelle Bachelet, center, chat with U.S. Secretary of State John Kerry at the Our Ocean summit, Oct. 4, 2015. ​"The United States is taking serious steps to curb our carbon pollution and protect our waters," Obama said in the video message, citing his "special love for the ocean" from growing up in Hawaii and Indonesia. The country is developing the first new marine sanctuaries in more than a decade, both of historical and ecological importance. One is in the tidal waters of Maryland, part of the Chesapeake Bay system rich in marine life; the other is in Lake Michigan, one of the five Great Lakes, the world’s largest freshwater system. Obama’s video also announced a plan designed to bring a halt to the world's illegal and unregulated fishing trade. It involves "new partnerships to empower developing fishing nations to fight illegal in their own waters," the president said. For instance, a new U.S. task force traces seafood catches from their source to a U.S. entry point, to ensure sustainability and legality. A new partnership with Palau is testing remote surveillace technology. And the mFish partnership provides mobile devices and apps to small-scale fishing operators in Indonesia so they can obtain weather reports and market information; the pilot program is being broadened to other developing nations. Carbon dioxide from greenhouse gases, when mixed with saltwater, raises ocean acidity to dangerous levels, "stunting growth of shellfish, degrading coral reefs and putting the entire marine food web at risk," the secretary explained. Kerry encouraged conference discussions and "future initiatives" to focus on three areas: better monitoring of the open seas, "vigorous enforcement" of laws against illegal fishing, and a global agreement to curb climate change. Maryland’s newly designated Mallows Bay sanctuary is the first in the Chesapeake Bay, the country’s largest estuary. It also contains the country’s "largest and most diverse collection of historic shipwrecks," according to nomination papers, with 200 recorded there, including some dating from the late 1700s. 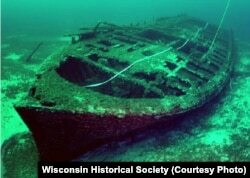 "We’re really focused on the [34 reported] shipwrecks," said John Broihahn, state archeologist, though he also pointed out that "Wisconsin and other Great Lakes states and Canada are working hard to re-establish lake trout fisheries" and confront invasive species. Chilean President Michelle Bachelet and Foreign Minister Heraldo Munoz also spoke at the conference.